My publisher, Kensington/Lyrical, is doing an advanced giveaway of my historical novel about a nurse in the civil war and soldier whose life she saves, Honor Before Heart. It is the first in the Emerald Belles series. It doesn't release until spring, but you can win it now! How awesome is that? I would love it if you'd drop by the Goodreads giveaway and enter. Shares and tweets are always hugely appreciated, of course, but if you just enter, you'll still make my day. I love to see that counter of entries go up! It looks good to my publisher and makes me smile. 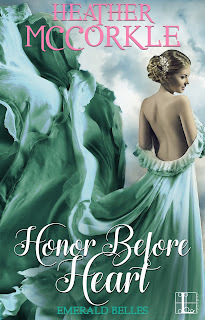 Honor Before Heart is Available for Pre-Order!